Social networking has become a key way for attorneys to generate firm awareness and make connections that lead to referrals and new business. The problem for many is learning how to do it effectively and efficiently, how to manage time, and finally, how to work it into their own personal marketing program. 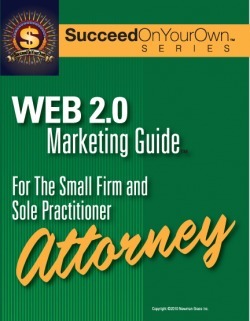 The answer is our WEB 2.0 Marketing Guide™. • Linked-In, Twitter, Facebook, Blogging, etc. : Which are a must and how do you leverage them to benefit your firm? 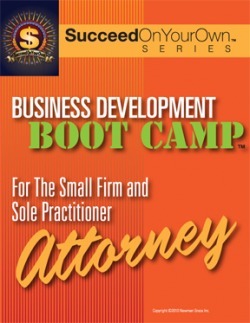 For the small firm and sole practitioner attorney (or individuals within a large firm), The Business Development BOOT CAMP™ is designed to jump start an inactive marketing program or get one started where there never was one. Perfect for partners and associates who have little or no experience in marketing, or who simply want to break through to the next level of business development. • Developing the "Ideal Referral"
• Creating Traffic-Building Social Marketing "Hot Buttons"
Now in its second printing, The Speaker Survival Guide has been adopted as a text at the University of Pennsylvania. Many corporations have purchased the SSG for executives, sales and marketing teams and managers to improve their pitches, presentations and communication skills. 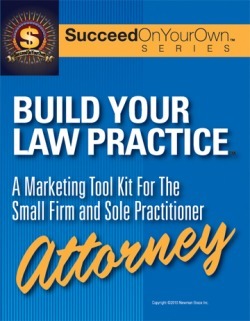 Many attorneys have purchased the SSG in order to help in their presentations and arguments. The Eloqui Method is a blend of entertainment industry performance techniques translated for the business professional. Impression Management tools have been added along with the latest research from Neuroscience so that readers can persuade and win in any venue. Don't Just Present. Persuade, Inspire, and Perform! Learn how to give powerhouse presentations that engage and move your audience. Imagine if every presentation received rapt attention and buy-in from the audience. Start getting these results with Own the Room, featuring the renowned Eloqui Method-innovative techniques that leave boring behind. Research shows a memorable presentation is a combination of stirring your audience's emotions while appealing to its intellect. This team of authors has developed techniques that tap into the persuasive, expressive aspects of presentations-employed over the past ten years by Fortune 500 companies such as TD Ameritrade, Mattel, Fisher-Price, Merrill Lynch, Siemens, and Pfizer. How and why do people connect? This is the premise behind this in-depth look into the world of business networking which exposes the psychological nature behind human interaction. Tapping extensive personal experience and numerous examples, Dr. Saleebey reveals the keys to becoming a successful networker by sharing his holistic approach to making connections or "networking as a way of life." Whether you are a seasoned veteran or just beginning, this book will help you move beyond the name tag when making connections so that you begin to build and maintain long-term mutally beneficial relationships.